VANCOUVER, CANADA – Kaizen Discovery Inc. (TSXV: KZD) announced today that it would begin a diamond-drilling program at the Fairholme copper-gold project in central New South Wales, Australia, early this month. The 2,300-metre drill program is designed to test several induced polarization (IP) chargeability anomalies generated by a Typhoon three-dimensional IP survey completed by High Power Exploration (HPX) between June and August 2014. "This will be the first significant test ever conducted on the large area that hosts the chargeability cluster, which never has been the focus of deep drilling," said B. Matthew Hornor, Kaizen's President and Chief Executive Officer. "We are on the verge of drill testing these porphyry copper-gold target areas of the Fairholme mineral system because the use of Typhoon's 3-D IP has enabled our team to map chargeability beneath a significant amount of conductive cover, which in the past has inhibited conventional IP surveys." The Fairholme Project consists of two contiguous exploration licences covering a 169-square-kilometre area located 360 kilometres west of Sydney and 160 kilometres west of the town of Orange. The project is located in the highly prospective Macquarie Arc, a well mineralized Ordovician-Silurian belt that includes several important copper-gold deposits, including the world-class Cadia deposit. The Fairholme area has been explored by various companies since the 1970s. 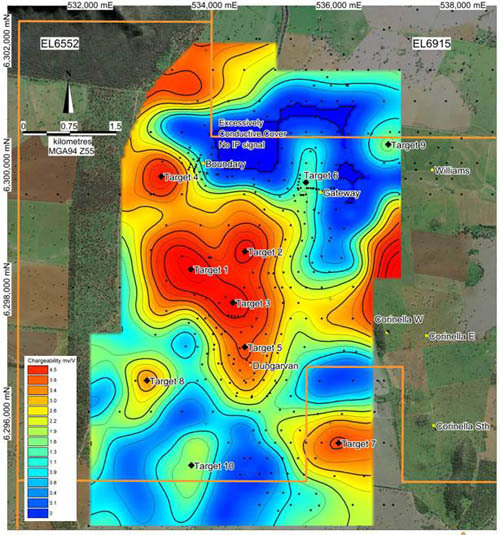 The most significant work was completed by Newcrest, which conducted an extensive exploration program over the Fairholme Igneous Complex between 1993 and 2005. It is estimated that Newcrest spent more than A$4 million on the project during this period. A total of 701 aircore holes (55,614 metres), 30 reverse-circulation holes (4,810 metres) and 17 diamond holes (6,575 metres) have been completed, most drilled by Newcrest within the present property boundary. Newcrest partly delineated three significant altered and mineralized zones (Boundary, Dungarvan and Gateway), with drill intercepts of up to 0.20% copper and 0.71 grams per tonne (g/t) of gold over 37 metres at Boundary (DR039, 220-257 metres), and 0.14% copper and 0.15 g/t gold over 50 metres at Dungarvan (DR046, 485-535 metres). The recently completed IP survey at Fairholme utilized 61 transmitter positions and an array of 123 line kilometres of receivers over 31 square kilometres. The IP data were of extremely high quality, with the error of the apparent chargeability measurements estimated at 0.016 mV/V, or 0.8%. The data are the most accurate collected with the Typhoon system to date. Ten chargeable IP anomalies were defined by the survey, three of which (T1 to T3) form a large (2 x 2 kilometre) chargeability cluster between the Boundary, Dungarvan and Gateway prospects. A nearby chargeable anomaly (T5) is associated with geochemical anomalies at the Dungarvan prospect. The initial, three-hole drill program is designed to test the central chargeability cluster and anomaly T5 to a depth of 700 metres. Funding for the drill program will include up to A$198,750 provided by the New South Wales state government under its New Frontiers program. The Fairholme Project is being operated by Clancy Exploration Ltd. (ASX:CLY), based in Orange. Kaizen earned a 49% interest in the Fairholme Project on December 31, 2013 and has the right to increase its interest to 65% by funding an additional A$4 million in exploration prior to December 31, 2015, with the aim of delineating a scoping study. Kaizen can further increase its stake to 80% or 85% by funding a prefeasibility study (depending on the cost of the study). Kaizen will have the option to earn up to a 95% interest through additional, staged programs leading to a feasibility study. Under a January 2014 framework agreement, ITOCHU Corporation will be provided preferential rights to fund any future exploration programs contemplated at Fairholme. The framework agreement between Kaizen and ITOCHU Corporation established a collaborative working arrangement under which both companies agreed to evaluate opportunities to explore and develop selected, high-quality, international mineral projects. 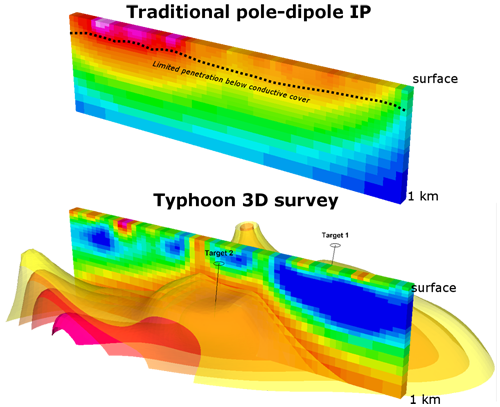 Figure 1: Plan view of the 3D chargeability model sliced at -450-metre depth, showing the locations of the 10 targets (contoured at 0.5mV/V intervals) with respect to the drill collars and prospect locations. Figure 2: The upper image shows the inverted chargeability model from Clancy's 2007 traditional induced polarization survey over the Boundary and Dungarvan prospects (left to right). 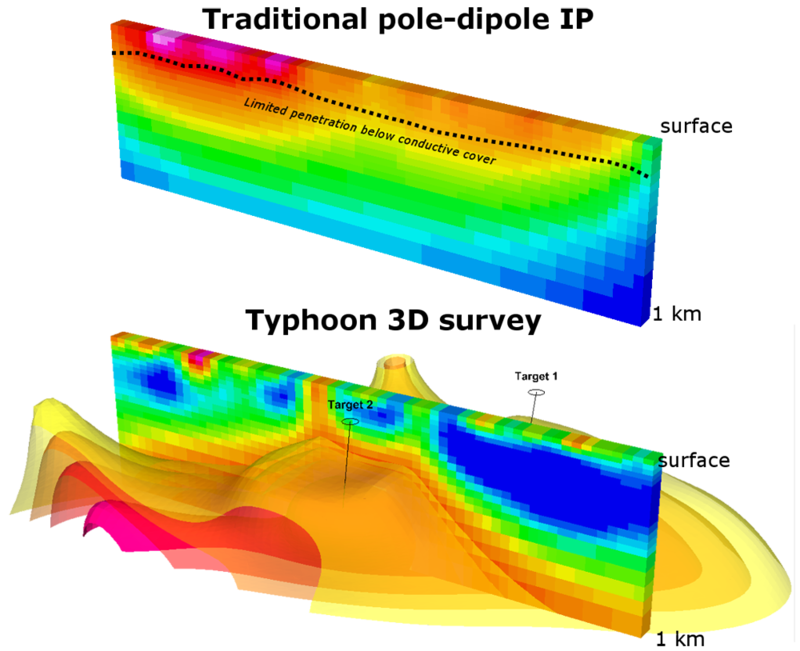 The lower image shows the inverted chargeability model from the Typhoon 3-D IP survey for the same line. Kaizen's disclosure of a technical or scientific nature in this news release has been reviewed and approved by John Bradford, M.Sc., P.Geo. and Chief Geologist for Kaizen, who serves as a Qualified Person, as defined under National Instrument 43-101. For more information regarding data verification measures used to support the Fairholme scientific and technical information, please refer to the Fairholme Technical Report dated February 26, 2014, prepared by SRK Consulting (Australasia) Pty. Ltd., in accordance with National Instrument 43-101 Standards of Disclosure for Mineral Projects, and available at www.sedar.com and at www.kaizendiscovery.com. Kaizen is a Canadian technology-focused, mineral exploration and development company. Kaizen entered into a collaboration agreement with ITOCHU Corporation of Japan (market capitalization of approximately $20 billion; ticker symbol 8001: Tokyo) in January 2014 and has access to HPX TechCo's proprietary geophysical Typhoon technology under a dedicated services agreement. Kaizen's long-term growth strategy is to work with Japanese entities to identify, explore and develop high-quality mineral projects that have the potential to produce and deliver minerals to Japan's industrial sector. Forward-looking statements may include, without limitation, statements regarding the date of initiation of diamond drilling, the number of metres that are planned to be drilled at the Fairholme Project, the identification, exploration, and development of high-quality mineral projects and the delivery of minerals to Japan's industrial sector. Although Kaizen has attempted to identify important factors that could cause actual results, performance or achievements to differ materially from those contained in the forward-looking statements, there can be other factors that cause results, performance or achievements not to be as anticipated, estimated or intended. There can be no assurance that such information will prove to be accurate or that management's expectations or estimates of future developments, circumstances or results will materialize. As a result of these risks and uncertainties, the results or events predicted in these forward-looking statements may differ materially from actual results or events.